Information portal for International Temari Appreciation Day (ITAD for short) which is celebrated on 22nd of October each year. The first ITAD was celebrated in 2010. Hi Everyone! I can't quite believe it but there are only 14 days until ITAD 2011. You can celebrate the day by working on your own temari, teaching someone else about temari or maybe even giving some away. Actually there is no end of ways you can celebrate ITAD just let your imagination run wild. Your own celebration can be as simple or elaborate as you wish. Why don't you visit your local Japanese garden (many towns have them) and find a Sunny or shady spot and have a little stitch while reflecting on what you love about temari making, what brought you to it or planning some goals (or projects) for the future. 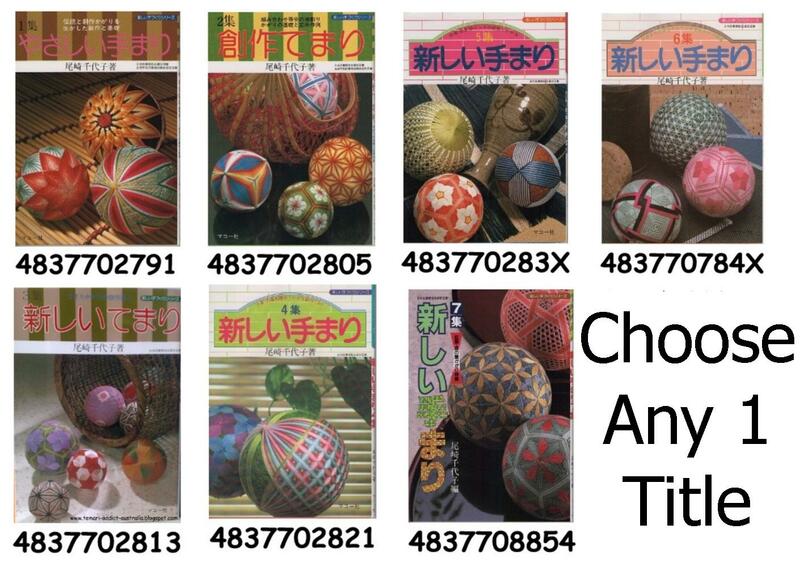 I think I might spend some time stitching in a local cafe and take along some of my temari (that I am happy to giveaway) and give them to people who show an interest in what I am doing. I also have a 2 day workshop booked for the following weekend 29/30th so that is also part of my plans for celebrating temari day. Have a think about what you would like to do to celebrate the craft of temari making in your local community. I'd love to know what you do to celebrate. You can share your story by emailing me at intltemariday@gmail.com and I'll add it to the ITAD blog (your photos are welcome too. So here is the incentive to share your celebration. Send me a short note about your celebration (with or without a photo) and I will randomly select one contributor who will win 1 copy of any volume in the Cosmo Book series. Yes that's right I will give the winner a volume of their choice from the seven books in the Cosmo Book series. Never owned a Japanese language temari book? Here is your chance to get your hands on one... Missing one of the series? Complete your set with a freebie from me. I'll even post it to you for free. Yay!!! Small print: Yep there always has to be a bit of small print. This is a competition of chance not skill. The one (1) winner will be drawn at random from all the entries received at the linked address above by midnight Australian WST (+8 GMT) on 11 November 2011. By entering the competition you agree to have your entry appear on the ITAD website. You don't need to write an epic length entry, 100 words or less is more than fine. How much is 100 words? The section of text above highlighted in pink is just under 100 words - actually there are 92 words to be precise. The prize is one (1) book from the Cosmo Temari book series written by Ozaki Sensei valued at $20AUD. 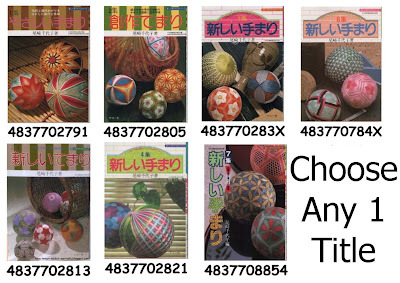 The book is winners choice subject to availability at the Temari Addict Australia webstore. I will also cover the cost of standard postage to your delivery address no matter where you live on our big planet. I will need to contact the winner for a mailing address so I can post your prize. If the winner has not contacted me to provide their postal address after 30 days from the prize draw date, there will be a redraw. Now go get ready to celebrate ITAD 2011. I have made temari for about six years and enjoy gifting them. One such lady is waiting for a kidney transplant and the intensity with which she studied that temari really moved me. I had heard of 'focus' balls and she taught me what that means. Please do not put my name in for a prize. Happy International Temari Appreciation Day 2011. We offer a wide range of free services and information sites for you please visit some of our free websites.